Bob Baker's Indie Music Promotion Blog: New Productivity Tool - Your Got-Done List! New Productivity Tool - Your Got-Done List! You make them. I make them. 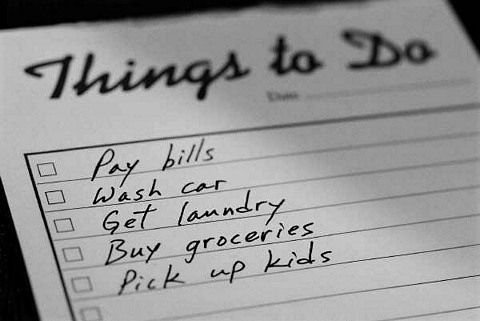 Just about everybody uses or has used a To-Do List to get things done. Of course. How else would we know what to focus our energy and attention on every day? No doubt, To-Do Lists serve an important purpose. But if you're anything like me, seeing all the things on your list that don't get done can be frustrating. No matter how diligent and effective you may be, there's always a growing list of things you just can't get to during any given day, week or month. That's why I suggest you start a new list: Your Got-Done List. Yes! You need to acknowledge and celebrate what you've already accomplished to truly feel good about all this list-making activity. At the end of a busy day, has anyone ever asked you what you did that day? Most likely you hemmed and hawed and could only remember a couple of things. That's sad. Not long ago I created my own Got-Done List sheet. For a couple of days, as I completed various tasks (whether they were on my To-Do List or not) I wrote them down on the sheet. At the end of each day I was amazed at how much I had accomplished over the course of several hours. As I looked over each day's long list of completed tasks, I felt satisfied and productive. But that rarely happens when you focus only on your To-Do List -- which really should be renamed the "Bunch of Stuff I'm Too Lame to Get Done List"! How empowered do you feel when you focus only on the unfinished tasks you still have yet to do? The best way to get things done is to create both lists: One to record the important stuff you want or need to get done, and another to log the (hopefully) many things you actually do. But my view of you is more optimistic. I know you proactively pursue your passions and take steps every day to make a difference with your music and your message. And to you I say, "Make a daily Got-Done List to celebrate all of your many accomplishments." What do you think? Have you ever used this idea? Did I miss something? I welcome your comments. I love my Get-it-done lists! In fact, I'm fairly lost without a checklist for booking, blogging, and social media. The bad thing for newbies is writing down way too much and getting overwhelmed. Tim Ferriss suggested a simple way to battle this. Use a little post-it note and write down the top 5 things to get done. If it's just a little post-it note, it's hard to get overwhelmed, and it forces you to focus on the most important things. I use an app on my ipod to maintain the multiple too lame to do lists. It does have a list of completed tasks which I clear out once a week. Currently 51 items in the list for this week. Bob, I totally agree! I've been doing this for years. I used to just do it at the end of the year. New Year's day I'd sit down with a notebook and consider what were the major things I'd accomplished in the previous year. Then I'd plot out a course for which major things I'd like to accomplish in the next year. Then about 1987 I started using Daytimers 2-Page a day format planners (the checkbook size ones that you can fit in your jacket pocket). It's a very cool format because the page on the left is divided into two halves. The top is "To Be Done Today" and the bottom is "Dairy and Work Record." The page on the right is for "Appointments and Scheduled Events" with a space for "Expenses and Reimbursement" (which I use for ALL of my transactions, including checks written and received). It took me awhile to get used to writing in the "Diary and Work Record" section, but now I find that to be indispensable. I've got 25 years worth of these things and can go back and look at records of gigs I played, who was on them, who I met, and a wealth of other information that would otherwise probably be forgotten. It's also very useful to look back each month at the previous month for things that you've started that might fall through the cracks. It's far too easy to start a million projects and drop the ball on some important ones because there's just too much going on to remember everything. Once you've invested energy in a project, it's important to stick with it, often over a long period of time. These books are expensive, but I've found them well worth it in terms of my productivity. Great advice, Bob! I'm glad someone else does this, too. I tried using a few different apps and services for to-do lists. I've been using Apple's simple "Reminders" app. At the end of the day, it's nice to swipe to the "Completed" section and see my progress. I also have an ongoing monthly list on a word document. Each task is in black. I change all completed tasks to the strike through font and add the action, time, date etc. Tasks that didn't come to fruition are changed to red (with actions, outcome, times dates etc. )Those still ongoing that I have started are in green. Completed tasks get struck off and changed to pink, my favourite colour. Then, every few short tasks that get completed, I'll either celebrate with a dance to my favourite song around the studio, bake something or do something else that I enjoy to pat myself on the back. Looking back over notes and lists in a diary is a great way to realise and remember how much you have achieved. It is also a great way to boost you if you are feeling overwhelmed or out of your depth. I tended to be hard on myself for never finishing that list, now I see it as a blessing that there are so many things to be achieved. It means my creativity is flowing and I have a purpose. Monitoring progress as I go is so fulfilling!